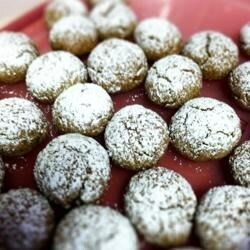 "I have searched far and wide for a recipe that mimics my favorite, store-bought version of these cookies. I think, after days of thrown-out cookies, I have come as close as I can get." Stir together the molasses, honey, shortening, and margarine in a saucepan over medium heat; cook and stir until creamy. Remove from heat and allow to cool to room temperature. Stir in the eggs. Combine the flour, white sugar, brown sugar, cardamom, nutmeg, cloves, ginger, anise, cinnamon, baking soda, pepper, and salt in a large bowl. Add the molasses mixture and stir until thoroughly combines. Refrigerate at least 2 hours. Preheat oven to 325 degrees F (165 degrees C). Roll the dough into acorn-sized balls. Arrange on baking sheets, spacing at least 1 inch apart. Bake in preheated oven 10 to 15 minutes. Move to a rack to cool. Dust cooled cookies with confectioners' sugar. These are SO yummy! The only problem I had was that the dough was very, very crumbly. I'll try and back off on the flour a bit next time, but this is a definite repeat!